James Purdy isn’t amongst the better-known figures of 20th-century American literature but his work was highly esteemed by Dorothy Parker, Tennessee Williams, Gore Vidal and many others. The Paradise Circus was first published as part of a collection of his plays in 2009 and Anthony Biggs’s production marks its world premiere. This piece of American Gothic is rather like The Mayor of Casterbridge meets The Merchant of Venice and King Lear, with a touch of The Glass Menagerie. 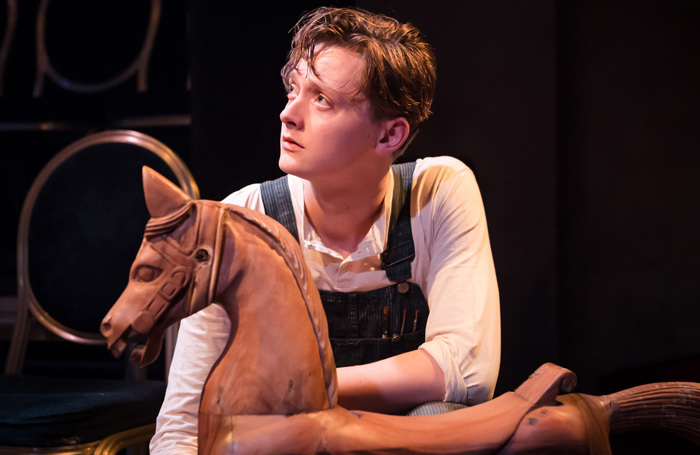 Mourning the death of his perfect eldest son in the First World War, Arthur Rawlings (Tim Woodward), an emotionally unavailable hardware store owner, sells his two younger sons to a travelling circus. The locale is unspecified; it often feels Southern, especially with Chris Drohan’s blues-influenced musical interludes performed by Darren Berry, but is more likely Midwestern (Purdy grew up in Ohio). At the centre of Biggs’ in-the-round staging is Cecilia Trono’s appealingly whimsical design characterised by a fairground gazebo covered with lace and fairy lights. Every circus has a dark underbelly just as every small town has its resident eccentric – found here in the form of Alda Pennington (Sophie Ward, compelling in her stillness), local herbalist, “witch” and badass frontierswoman. The undernourished, sickly boys (Sam Coulson and Joshua Ward) are largely blank canvases, their bond being the only sweetness in all the bitterness. The second act rambles somewhat, culminating in a not especially convincing deathbed scene – though it’s quite something to think that Purdy (it is believed) wrote this play when he was barely 20.